Arroyo Lodge No. 274 F. & A.M.
On the evening of December 18, 1883, fifteen Masonic Brothers met in Meherin’s Hall for the purpose of forming a Masonic Lodge. This build­ ing still exists, and is located at the southeast corner of Bridge and Branch Streets in Arroyo Grande. At this preliminary meeting, the name of Arroyo Lodge was chosen, and the following officers were elected: John William Flint, Worshipful Master; Beder John Wood, Senior Warden; and Irwin J. Monroe, Junior Warden. At a following meeting Shorts Hall was chosen as the Lodge’s regular meeting place. Shorts Hall was located on Branch Street where the flower shop and Dr. Pence’s office are now located. The rental cost of the hall was $100 per year. The new officers petitioned the Grand Lodge for authorization to form a lodge in the City of Arroyo Grande. The dispensation was granted, and the first official meeting of Arroyo Lodge was held on April 17, 1884. The stated meetings were held on the Tuesday on or before the full moon of the month. Applications for the Degrees and Affiliations were handled by committees in Open Lodge. Dues were $6.00 a year, and later were raised to $9.00 a year in 1886. Meetings were often cancelled when Winter storms made roads impassable. Meetings were also cancelled during the Harvest Season. On February 21, 1887 a committee was appointed to obtain two brazen pillars for the Lodge. The pillars were purchased for $62.25 on June 19, 1888. The pillars we use today are those same pillars we pur­ chased in 1888. In 1888 the Secretary’s salary was $9.00 a year, and the Grand Lodge Per Capita Tax was $48.70. The Ramona Chapter Order of Eastern Star was instituted in June 1888, and a joint installation of officers was held between the Star and the Arroyo Lodge. During the 1890’s and early 1900’s the Lodge paid for medicine, doctor bills, and funeral expenses of its members. During those days the Lodge would meet for a funeral service in the Lodge Room; open Lodge and repair to the deceased Brother’s home for the funeral service; then to the cemetary, and finally back to the Lodge Room to close the Lodge. On October 7, 1902 the Most Worshipful Grand Master made his Official Visit to this area. It was a stated meeting, a very short one, after which a Third Degree was conferred. moving to the 1.O.O.F. Hall on Bridge St. This stone building is still there. The committee reported that it would be better to buy Shorts Hall with the Knights of Pythias, and trustees were picked from each Lodge. On March 29, 1904 the trustees asked for and received a payment of $173.50. investigation of candidates for the degrees and affiliation would be a secret committee appointed by the Worshipful Master. called into the Navy. Dispensation was granted, and on November 10, Brother Charles Maurice Denham received the Entered Apprentice Degree. On November 12 he passed to the Fellowcraft Degree, and later in Novem­ ber was raised to the sublime Degree of Master Mason. Brother Denham was raised by his father, a Past Master. officers was held in the 1.O.O.F. Hall. Peter Pera’s applications for the Degrees were read and accepted, and on December 17, 1918 Brother Raymond Sevier was raised a Master Mason. He is our oldest living Past Master. The first mention about having a new building was on July 6, 1920. Officer’s jewels were cleaned and cords were replaced for $16.11 on May 3, 1921. On the same date a warrant was drawn for $5.00 to pay for a new Master’s hat. Brother Ray and two other Brethren went into the country and purchased three turkeys for the banquet to proceed the 1922 Installation of Officers. They took them to Ray’s house where they were killed and dressed. Then Brother Hock, a baker, roasted them. March 1922 brought more discussion for a new Lodge hall. In Sep­ tember 1922 Proclamation by the Grand Master Burk requested a Public School Week be held that year during the week of September 18, 1922. On June 24, 1924 a joint picnic was held with the members of the Arroyo Lodge and the Ramona Chapter. Several of these were held during the early years of both bodies. On March 3, 1925, committees of Arroyo Lodge and the Knights of Pythias were appointed to appraise the property of the combined Lodges. On April 7, 1925 the Masonic committee approached the Knights of Pythias offering to purchase their interest not to exceed $2500. On May 5, 1925 trustees of Arroyo Lodge made a proposal to the Knights to either accept $2,000. or buy out Arroyo Lodge’s share. They were given three weeks to approve or reject the proposal. On June 2, 1925 the Knights of Pythias refused to buy out Arroyo Lodge’s share because they did not have the funds, and a motion was made and carried that Arroyo Lodge buy out the Knight’s share for $2250. On August 4, 1925 Brother Hienrich made an oral report that the Masonic bodies had purchased one half of the Hall interest from the Knights of Pythias. subject indicates that Brother W. C. Poole offered to sell the Lodge a lot (name of the street not mentioned) for $650. to erect a Masonic building, the cost of which was not to exceed$10,600. On July 3, 1928 a motion was made and passed that $1,000 be transferred to the building account, and the trustees to negotiate loans and sign notes guaranteeing payment. R. Hienrich, W. C. Poole, and their wives to pay all bills on the building. On September 6, 1928 it was recorded that R. L. Bird and his wife Iva M. Bird did convey lots number 7 and 8 of the Poole Tract February 4, 1928. A transcript of this is on page 127, third book of minutes. The Secretary wrote to Brother Thomas Baker, Grand Lecturer, asking if it would be possible for the Grand Master to lay the corner­ stone and dedicate the new temple on October 24, 1928. Brother Harry Truesdale was Worshipful Master in 1929, and on January 31, 1929 the officers for that year were installed by the Most Worshipful Gus A. Hutaff, Grand Master, aided by Worshipful Tom Baker as Master of Ceremonies. Prior to the installation ceremonies, the Temple was dedicated by the Most Worshipful Grand Master, and the Grand Lodge Officers. the By-Laws to read, ” .. .” the stated meeting of each month will be on the third Tuesday at eight o’clock p.m.” The first stated meeting on the third Tuesday was held on June 18, 1929, and on that date a bill was presented from W. W. Mathews for $60, and was paid by the trustees. The Worshipful Master asked the Brethren to meet on July 23 to cut the weeds on the lot, it could not be done as it rained that day. On January 20, 1933 a motion was made and passed that the in­ debtedness with the San Luis Obispo Building and Loan be transferred to Brother Wixon. The secretary was asked to write the Ramona Chapter and thank them for the new curtains in the building. On September 25, 1935 a meeting was called to celebrate the fiftieth anniversary of this Lodge. Brother Harold Tannis was Master. Part of the ceremonies was the presentation of a fifty-year gold button from Grand Lodge to Brother A. W. Hawkins by Brother Adriance, representing Grand Lodge. On that same evening a gavel was presented to the Lodge by the Hespian Lodge. Brother Truesdale presented a Past Master’s apron to Brother Hawkins from the members of the Lodge. In May 1936 there was a discussion on selling the lot on Branch Street, and on February 16, 1937 the lot was sold to Mr. and Mrs. Henry Agueda for $500. On October 16, 1938 on motion by silent vote it was carried to sell non-interesting-bearing notes to the brothers to refinance the temple indebtedness. On January 17, 1939 Brother W. J. Patton received the Entered Apprentice Degree. On January 24 he was passed to the Degree of Fellowcraft, and on January 31 he was raised to the sublime Degree of Master Mason. $5000 to be paid back at $30 a month including the interest and principal. Brother Chester Addison Wixson passed away on June 23, 1940, and full Masonic services were held at his graveside on June 25th. As noted earlier, Brother Wixson was one of the builders of the Temple. November 18, 1941 was the first mention of Brother Chester H. Warlow as Grand Lecturer. He later became the Most Worshipful Grand Master of Masons in California. I am sure that there are many here tonight who will remember him. stating that the Temple Board would consist of the junior Past Master, the Worshipful Master as the chairman, the Senior Warden, the Junior Warden, the Secretary as Secretary, the Treasurer as Treasurer, and what their powers would be. approval of Mrs. Emily Duncan’s admission to the Masonic Home, and on November 17, 1942 a letter was read from the Grand Secretary that the Board of Trustees of the Masonic Home had accepted Mrs. Duncan’s request. $1,700. Only seven volunteers of those present would do so. It was laid over for further discussion. On September 21, 1943 a motion was made at the request of the Grand Master that the Lodges buy War Bonds. It was moved, seconded, and passed that this Lodge buy $280 worth of bonds. On October 19, 1943 Brothers Lierly and Hienrich were appointed to consult with Mrs. Wixson and see what could be done about the mortgage. They had gone to the Recorder’s office and found that it could be paid off at $30 or more a month (this included the principal and interest), as had been learned in 1939. On March 21, 1944 the Worshipful Master informed the Brothers that the Lodge still owed Brother Grizzle $404.50. Brother Grizzle had been one of the larger donors when the Temple was built, and had been paid back a little at a time over the years. It was moved, seconded, and passed that the Lodge pay Brother Grizzle the full amount of $404.50. Laws be raised to $50 to comply with Grand Lodge By-Laws. Our fees had been $35. On Sunday July 13, 1947 several of the Brothers assembled at the Temple to have breakfast and to paint the outside woodwork. Some of the Brothers said they did not care how high they went as long as they could keep one foot on the ground. We met again the next weekend and finished the painting. In 1948 our charter had been sent to the Grand Secretary, and on October 19, 1948 a photostatic copy and the charter were returned to us. Brother Guy Stewart, manager of the Bank of America in Arroyo Grande, said that he put the original in a vault at the bank for safe-keeping. In the early 1950’s by order of the State Fire Marshal, the Temple had to have panic bars installed on some outside doors and a fire escape from the Lodge Room. The work was done by several of the Brothers who were handy with tools. On May 16, 1950 Arroyo Lodge was transferred from the then 68th Masonic district to the 69th Masonic district, as explained by the Grand Lodge to equalize the two districts. The 68th district was composed of San Miguel, Paso Robles, Atascadero, San Luis Obispo, San Simeon, and Arroyo Grande. The 69th district, after the change, included Arroyo Grande, Santa Maria, Guadalupe, Lompoc, and Santa Ynez Valley. No record as yet as to when the districts were numbered as they are now. $50 less than owed if paid within the month. It was moved, seconded, and carried that the necessary amount be transferred from the Lodge funds to the Temple Association Fund to settle the mortgage account. No figure was given. On June 9, 1951 several of the Brothers from the Caledonia Lodge in Bakersfield traveled to our Lodge at the invitation of the Worshipful Master, formally a member of that Lodge, to confer a Third Degree, and Inspector Brother Watson told us after the Degree that there was some similarity in the work between the coast and Bakersfield. In September Brother Harry Sorensen was appointed to arrange for a bus and collect fees for a trip to Caledonia Lodge to confer a Third Degree at that Lodge. Twenty-seven of the local Brothers made the trip. At the December 1951 meeting Brother Lierly had obtained all but one of the Past Masters and Charter Members pictures. Also on that date, the Secretary’s salary was raised to two dollars a meeting. north, east, and southwest corners of the Lodge and Banquet Rooms. Now we marvel that none of the lady’s long formals ever caught fire! On May 19, 1953, a Rheem low-speed gas heater was ordered for the Banquet Room, and on August 13 it was installed in the lower men’s room with the vents in the Banquet Room. and the Secretary was purchased at the cost of twenty-one dollars and fifty-one cents. During the early months of 1956 many letters were exchanged between the Grand Lodge of Pennsylvania and this Lodge in an attempt to get the widow of Brother Van, a member of a Lodge in that state, into the Masonic Home there. In April of that year we received notice that Mrs. Olive Van would be admitted to the home in Elizabethtown, PA, and in early May Mrs. Van was put on a plane for Pennsylvania. $2,500 of the Lodge funds be transferred to the Temple Association Funds. Pope Jr. was raised to the sublime Degree of Master Mason on June 10, 1958 by the Past Masters of Arroyo Lodge. He served as Worshipful Master in 1964, and is now our present Worshipful Master. On April 21, 1959 a resolution was read to raise the fees for the Degrees from $50 to $65, and by motion it was carried to become effective January 1, 1960. On May 8, 1959 the Most Worshipful Grand Master, Phil N. Meyers made a visit to our Lodge, accompanied with his Grand Junior Deacon, the Worshipful Henry Drashner, the Inspector of this district; also five visiting Inspectors. The meeting was preceeded by a barbecue dinner. On September 15, 1959 it was moved, seconded, and carried that the Temple Association purchase a new carpet for the Lodge Room, and also to purchase theatre chairs. The lowest of the three bids for the carpet was from a firm in San Luis Obispo for $1,800. Four of the Brothers went to the Los Angeles area and checked for used and new theatre chairs, and found the best buy was in Compton. The repainted and upholstered chairs cost $12.95 each. Secretary be purchased from Brittain’s Stationery for $68. On April 16, 1963 the Secretary’s salary was raised to $30/month. September 17, 1963 was when there was the first mention of having Trestle Boards printed, and to obtain a bulk-rate mailing permit. parking lot, and two bids were obtained: one from a Ferrini in San Luis Obispo for $2,135 and one from McGray in Santa Maria for $1,680; the lot size was 1400 sq. ft. A motion was carried that we accept the bid of McGray in Santa Maria. the Banquet Room tables and put formica tops on them. On August 17, 1965 a resolution was read in two parts-first to raise the dues to twenty dollars a year and second to raise the fees for membership by initiation to seventy-five dollars. These resolutions wre voted on at the September meeting and ballot for the raising of dues resulted in nineteen in favor and four opposed. The ballot for the fees to be raised were unanimous (resolutions to become effective January 1, 1966 if approved by Grand Lodge). A letter was read from Grand Lodge at our stated meeting of October 1965 approving the resolutions. Another letter of the same date stating that Worshipful Hugh 0. Pope Jr. had been appointed Inspector of the 506th Masonic district. Early in 1967 a carpet was laid in the Ante Room and stairway. In March 1968 Brother Troxell asked for help to put a roof over the barbecue pit to enable the cooks to provide a barbecue dinner during a rainstorm. the Secretary’s salary be raised from $30 to $50 a month. In February 1973 the Secretary’s salary was again raised to $75 a month. At the August stated meeting a resolution was read to raise the dues from $20 to $25. The resolution was adopted at the September stated meeting, and at the November stated meeting a written ballot was taken; the results were 10 in favor and 30 against the resolution. adopted by a unanimous oral vote. 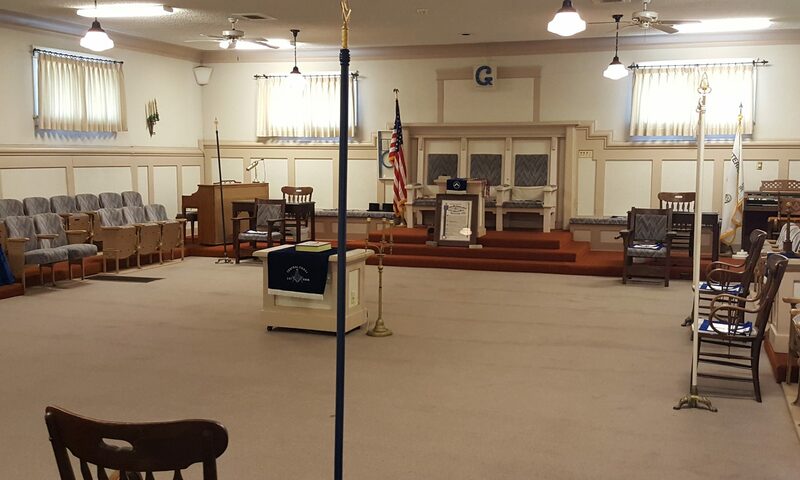 On March 16, 1976 the chairman of the Board of Trustees of the Temple Association informed the Lodge that the Association had the funds available to put a new rug in the Lodge Room and in the Preparation Room. It was moved, seconded, and carried that the Temple Association be allowed to purchase the rug. On June 16, 1976 a new rug was laid in the Lodge Room and Preparation Room. On January 20, 1979 the Most Worshipful Burton Meyer Jr., Past Grand Master, assisted by Brother Clarence Truesdale. as Master of Ceremonies, installed the officers for the year 1979. $24 a year, and at the December stated meeting the resolution was carried by a unanimous vote. count was 19 for and 13 against the resolution. The resolution lost, as there was not a 2/3 majority to carry. On April 16, 1983 Brother Baldwin, Chairman of the Board of Trustees, asked the Lodge to grant the request that the trustees be allowed to spend approximately $5,000 to remove the leaking, original slate roofing, and install new asbestos-type shingles. It was moved, seconded, and unanimously carried to do so. At the stated meeting in October, Brother Baldwin announced the roof had been repaired, and that the next project was to repaint the Lodge Room. The Lodge Room was redecorated during the last week in February and the first week in March. In closing, little did the original fifteen members ever envision what the Lodge would be today. From the fifteen charter members to two hundred and forty members today. We are sure the builders of 1928 would be pleased to see these Temple improvements. I thank the Worshipful Hugh O. Pope Jr. for the privilege of research­ ing the records and compiling this report for our Centennial ceremony. Fraternally submitted, Harry E. Davis, P.M.